This section has top access AND rear access. It includes a removable-and-adjustable divider shelf. Perfect way to add a lot more space to your bag. This item does not include a Main Handle or Shoulder Strap. If building a custom bag, make sure your order includes one or both. The CS5 was developed primarily for our IFR Flight Customers. By adding a CS5 to any configuration, you can now add IFR Binders and documents, without having to repack. In addition to IFR equipment, the CS5 is perfect for a couple days worth or clothes, two more sets of headsets, or a 13" laptop. The CS5 is 13.5" x 10.5" x 5". (And remember, it is a soft bag so it can expand slightly in every direction.) The CS5 can attach to all of the FLEX System modules. The CS5 also comes with a divider shelf that is attached to the sidewalls of the compartment by use of Velcro on each end. The velcro panels on the bag walls are quite large which allows you to move the divider shelf up and down to position the shelf right where you need it for your stuff (or take it completely out if you need). If you have the divider shelf installed, and if you're accessing the bag only from the top access, you won't (of course) be able to get those items underneath the divider shelf. To remedy this situation, (we did think of this occurance) we made it so that you can also zip open the entire rear panel of the module, thereby allowing you to grab all of the items inside, both above and below the divider shelf. So the CS5 has both top AND side access. Pretty cool. 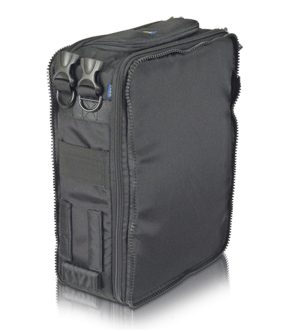 There are also two FLEX-Mount pocket stations on the outside of the bag, one on each side. You can install any two of your choice of the FLEX System side pockets onto the sides of the CS5 at these stations. The bottom of the bag has two plastic "skid plates" to help keep the bottom of the bag off the ground.